The resources contained in this web site represent information presented during a day-long workshop held at the May Memorial Unitarian Universalist Society (MMUUS) church, Syracuse, NY, on October 27, 2007, and at the Unitarian Church of Barneveld, Barneveld, NY, on November 10, 2007. It also served as a basis for helping our District’s History Team establish and initial a digital preservation effort in November of 2008. We hope they will provide some assistance in your own church history preservation and promotion activities. Is Laminating Old Paper a Good Idea? May the flame of our candle help us to focus today on our self-appointed task. May we bring our full attention to the day and may our efforts be fruitful. Out of our occupations and preoccupations, from the homes and churches that ask of us so much, we have come here to this place. Let us leave our daily concerns behind for the next few hours and direct our energies to the subject at hand. Let us honor those who have gone before and strive to preserve their words and wisdom. May we learn and grow during our time together. The purpose of the opening presentation was to set the scene for the workshop, help participants understand what to expect during the day, excite them about the possibilities, and engage them in providing their own thoughts, questions, and answers regarding the importance of church history. This was done through a PowerPoint slide show, an oral presentation, and dialogue among participants and resource people. The purpose of this workshop is to provide you with some ideas on what is needed in terms of acquiring, inventorying, and storing the historical material of importance to your church. We use the experiences of May Memorial and our current History Committee as a basis for thinking about such tasks, but we recognize that each church has unique needs, problems, and requirements for maintaining historical material. We hope that this workshop can be a means for not only learning what we have done at May Memorial, but also a sharing of your unique situation. Realistically, gathering, inventorying, and storing archival material must be ongoing and it requires time, resources, and dedicated people. However, we believe that the rewards from doing it right and doing it well are immense. They also are important for helping a church (and its members) maintain a sense of self as a religious institution. 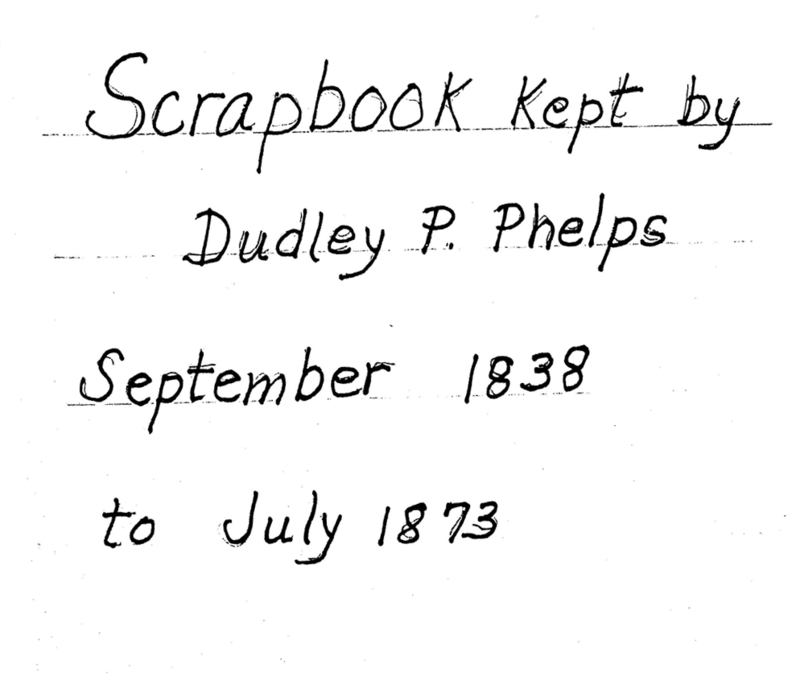 The management and storage of records of past church activities raises many questions. 1. How will the material be acquired? 2. What material will be saved and stored? 3. How will it be organized? 4. What steps are needed to preserve it? 5. Where and how will it be stored? 6. What retrieval and procedure for use and review of the material will be established? We will be discussing 1, 2, 3, and 5 and considering 6 as it applies to how 1, 2, 3, and 5 are undertaken. Step 4 is covered in another workshop. During this morning workshop, we can talk about changes and additions based on your experiences and specific needs. A list of archived material from The Unitarian Universalist Congregation of Atlanta is also attached (see Attachment B), so you can see the scope and organization of their material. It is interesting to see the effect of their history on what they have archived. How your material will be organized is completely up to you – the nature of the material, the storage facilities (space) available, the time and effort you want to put into establishing and maintaining the files. However, the organizational scheme used by the Atlanta church, some of the suggestions from the May Memorial Collection Guidelines, and the Syracuse University material will give you some ideas for your own organizational efforts. The where and how of church record storage is dependent on the individual church situation. Judging from the files we have in our church and those stored at Syracuse University, May Memorial has been very active in storing church history over the years, with a rich collection of material going back to the church’s founding in 1838. In the 1980s there had been a very active and dedicated committee working with church history. This committee produced an excellent booklet on church history which we hold in high regard (an interactive version of this history was completed by Rog Hiemstra and is available on the web). They also were the people responsible for placing material in the Syracuse University archives (the Syracuse University attachment represents the result of many of those efforts). After the work of that committee, the files were less well managed. Material was placed in the files or in the vicinity of the files by people working on various church activities who were naturally more focused on their own activities rather than on organizing the history files – still, they felt the material was important enough that it should be saved. When the current History Committee became active in early 2006, five full metal and two cardboard filing cabinets were found in the church furnace room, with cardboard boxes of file material piled on top of them. Other materials were found stashed away in cabinets and closets around the church building. Those metal files have been moved from the furnace room to a more suitable but cramped office location and one fire resistant metal cabinet and one extra wide metal cabinet added. All these metal cabinets are now locked and History Committee members and selected church leaders have keys or access to keys. The material in these files includes quantities of old newsletters, Sunday School (religious education) files, and general church files. As we have been examining these files, we have discovered many gems and some things we don’t need to keep. We are now in the process of inventorying the material in these files. (A partial list of this file survey activity is also attached as a sample of these efforts – see Attachment C.) We also have fairly complete boxes of files with information about the work of two past ministers and are collecting information on recent ministers. The minister files are being reviewed and preserved in preparation for transfer to the Syracuse University archives. There are other church records including old photos and slides, scrapbooks, microfilms, audio and video tapes and other media, and a few archival objects. Various History Committee members are working with the preservation of these materials. In addition to all of this, there is, or should be, an annual influx of additional records from all activities of the church (see item 2 in the second list on page one). For example, records of annual meetings could be a partial basis for this yearly addition to the archives. Materials in the church administrative office and other activity centers should also be reviewed for material from past years which should be moved to the history files. It should be noted that physical space must always be a consideration, so figure this limitation into all your planning, inventorying, and decisions on what to keep and even solicit. The above description of our experience with church record storage is given as an example of one church’s experience. It may provide you with some ideas of the situations, needs, and even surprises that can arise. A clean, dry, roomy church record storage facility is ideal, but seldom achievable. Transfer to an outside facility has advantages and disadvantages. It releases storage space. Researchers can find and access the material more easily. Once the material has been given over to the facility, you may not be able to access it as freely as you would like. As new communication and storage devices become available our storage capabilities could increase. May Memorial now includes its newsletter on its web site, along with audio of the sermons. The church’s PR Committee is discussing the feasibility of archiving such digital material. Church services also are recorded on DVDs for those who prefer to listen to or view such information in their own home. A question we have been asking ourselves, can or also should we store such media in our file cabinets? Such action has advantages and disadvantages. An obvious advantage is that future researchers and interested church members can revisit such information whenever it is appropriate. However, you also have to maintain a good index of what you have on the DVDs, as looking at a DVD case and perhaps a title is not the same as looking at a typed sermon. In addition, in the future will DVD players become obsolete and unavailable, such as with the difficulty today in access floppy discs or viewing microfilm? Records of May Memorial Unitarian Church in Syracuse, NY. Collection includes letters, photographs, newsletters, printed matter, audiotapes, brochures, Order of Worship handouts, etc. May Memorial Unitarian Church began in 1838 in Syracuse, New York. Its founders had left the Congregational Church of New England in Boston, preferring to study the gospels for themselves and worship according to individual conscience. The church was originally named "Church of the Messiah." Members of the congregation were active in the community; their second minister, Samuel Joseph May, was a well-known abolitionist and reformer best remembered in Syracuse for his part in the escape of Jerry, a runaway slave, memorialized in the "Jerry Rescue" sculpture in downtown Syracuse’s Clinton Square. In 1885 the church moved to James Street and named their new stone building "May Memorial Church" in his honor; some time later the group voted to change their name to May Memorial Unitarian Universalist Society. Contents include letters, photographs, deeds, wills, pew rental contracts, legal papers, marriage records, clippings, articles, books, Orders of Service, Sunday School reports, and many other items. Restrictions: There are no access restrictions on this material. Use Restrictions: Some restrictions on reproduction. Gift of May Memorial Unitarian Society, 1998. PITTS THEOLOGY LIBRARY, ARCHIVES AND MANUSCRIPTS DEPT. CITATION: Unitarian Universalist Congregation of Atlanta Records, RG 026, Archives and Manuscripts Dept., Pitts Theology Library, Emory University. The Unitarian Universalist Congregation of Atlanta has its roots in two separate congregations that were established in Atlanta in the late 19th century. In 1879 Rev. W. C. Bowman established a Universalist congregation that lasted less than a year. The next attempt was in1893 when Rev. Q. H. Shinn succeeded in organizing a congregation that became the First Universalist Church in 1895. George Chaney, a northern Unitarian minister and educator who founded the Artisan's Institute, a vocational school that later became Georgia Institute of Technology, conducted the first Unitarian service for a congregation of eight on February 19, 1882. The following year this congregation established the Church of our Father. 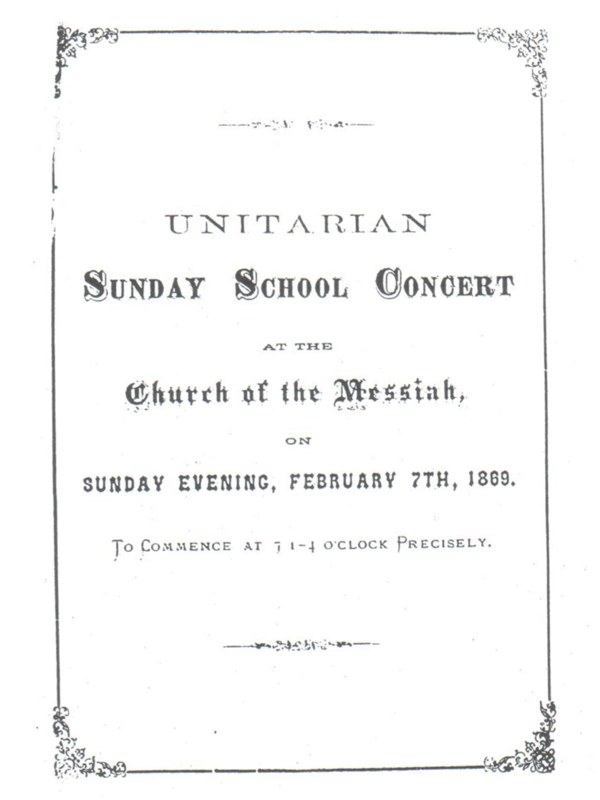 The church experienced growth and decline in its membership and ultimately changed its name to The Unitarian Church of Atlanta on June 9, 1904. In 1915 the American Unitarian Association (AUA) financed construction of a church building at 669 West Peachtree Street. 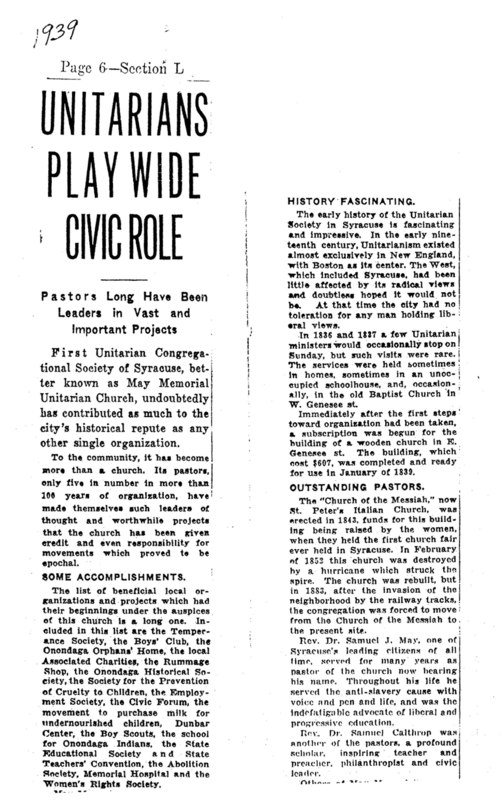 On November 14, 1918 the Unitarians merged with the Universalist congregation to form the Liberal Christian Church. This merger is particularly noteworthy because it occurred 43 years before the national bodies of these two denominations merged. Under the dynamic leadership of Rev. Clinton Lee Scott from 1926 to 1929, the congregation approved another name change in June 1927 and became the United Liberal Church. The effects of the Great Depression, however, almost caused the church to close its doors in 1934 but the congregation managed to persevere until the 1940s. The congregation's position on race almost destroyed the church during the late forties. In 1944, after the AUA criticized the church's policy on segregation, the congregation broke its ties with the national body. The ultimate crisis occurred in 1948, however, when the Rev. Isaiah Jonathan Domas resigned after the congregation refused membership to Dr. Thomas Baker Jones, an African-American Unitarian who chaired the Department of Social Work at Atlanta University. In response to this incident, the American Unitarian Ministers' Association urged its members to boycott the pastorate at the Atlanta church. The congregation stood its ground and turned to a minister from the Christian Church (Disciples of Christ) during part of this struggle. In 1951 the American Unitarian Association resolved the crisis by selling the church building out from under the congregation. The AUA provided an opportunity for a fresh start by sending Rev. Glenn O. Canfield to officially reorganize the church in the spring of 1952. A church building was purchased in 1953 and on January 20, 1954 the new United Liberal Church was officially reestablished. During the 1950s and 1960s the congregation demonstrated a commitment to the fight for human and civil rights. Rev. Edward A. Cahill and Rev. Eugene Pickett followed Canfield in providing the leadership the congregation needed during these tumultuous decades. On February 21, 1965, the congregation adopted a new constitution and changed the name of the church to the Unitarian Universalist Congregation of Atlanta. That same year construction began on the new church building located on Cliff Valley Way. The church is governed by a Board of Trustees in accordance with instructions by the congregation and the authority delegated by the congregation through the bylaws and polices. The Board consists of eighteen members, including the president of the congregation, the chief financial officer and the two additional trustees of finance. All of these officials are elected by the congregation. The Executive Committee of the Board consists of the president of the congregation, vice-president of the congregation, chief financial officer of the congregation, and as ex-officio members, the senior minister and church administrator. This committee attends to details of business that are delegated by the Board of Trustees and reports its recommendations to the Board. The church's ministry consists of the senior minister, an associate minister and an assistant minister. This collection consists of the minutes, correspondence, bulletins, brochures and publications, reports, newsletters, sermons, photographs, and other material that document the history and activities of the congregation. Of particular importance are the minutes of the Board of Trustees and church committees, the bylaws, and the constitutions. The collection also contains an almost complete set of bulletins or orders of service and newsletters from 1952-1983. The sub-series, Publications of UUCA Press, consists of everything produced by the church to announce events and issues, programs of events, and other documents that reveal the activities supported by the congregation. The collection also contains sermons, student notebooks, and some miscellaneous correspondence that were written by or belonged to George Chaney. Sermons and lectures, primarily from the 1970s and early 1980s, are also included. In addition to Chaney, the collection contains sermons or lectures delivered by Ed Cahill, Donald J. Jacobson, Robert Karnan, Delos B. McKown, Glyn Pruce, David O. Rankin, Charles Reinhardt, Carl Scovel, Todd Taylor, and Sydney Wilde-Nugent. The records also contain clippings and other material documenting the congregation's involvement in and support for the civil rights movement during the 1950s and 1960s. Drawer Label: Administration - Church School and Newsletter. Folder 2: (no Label) RE Material from 50s & RE descriptive bulletin from ‘68-‘69. Folder 3: “Church School Study” -- letters and reports relative to defining the RE program, probably in 1915. The purpose of this workshop was to describe how you maintain, store, and preserve the media used to document the life and times of your church. Participants were encouraged to share their own experiences in media preservation. A PowerPoint slide show, an oral presentation, and dialogue among participants and the workshop leader were utilized. When I first became involved with the History Committee I was handed a plastic bag containing an example of what I might expect to find in the files relating to visual imagery. The bag contained several boxes of slides along with print photos, and one roll of micro-film marked Roll II. Eager to get started, I began with scanning the slides, a process that I was familiar with. The roll of micro-film was left for a later time. Once I had exhausted the first batch of slides I decided to take a look at the micro-film by unrolling the leader and viewing it on a slide sorting tray. I learned that the film had been produced in the mid 70s a time when materials were being readied to turn over to Syracuse University. The list of materials listed on the leader included scrap books dating from the early 50s. My curiosity aroused I began thinking that if I was in possession of roll II there might be a roll I, a thought that prompted me to return to the file drawers, and sure enough I found Roll I. Eagerly unrolling the leader of roll I, I discovered to my delight and amazement that the roll contained professionally produced photos of a scrapbook kept by Dudley Phelps covering a period from September 1838 thru July 1873, a period that covered the entire ministry of Samuel J. May. 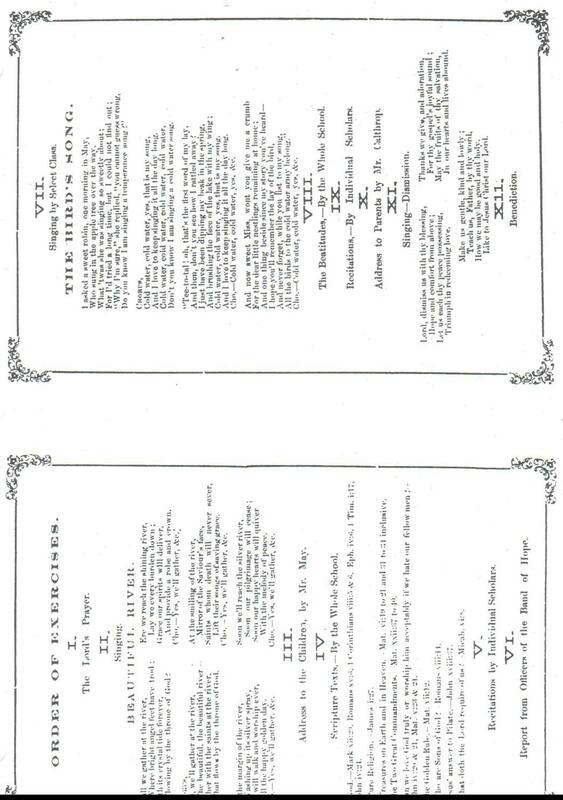 Following are a few sample pages copied from that film. · Neutralizing acidic paper with Bookkeeper Deacidification aerosol spray or Bookkeeper Deacidification pump bottle spray – this latter option is the “greener” choice and the bottles can be purchased in bulk and provide a better yield (see information in your resource booklet on supply costs. · You should be cautioned that the Bookkeeper material contains Magnesium Oxide, so use gloves and newspaper backing to protect tables or other furniture as you are spraying. The same rules which apply for long-term storage of paper documents generally apply to photos, except the deacidification spray should never be used. · Develop a procedure for compiling/sorting/identifying sermons, newsletters, etc. When ANTIQUES ROADSHOW visited Hot Springs, Arkansas, a man named Scott stopped by with a framed letter dated March 5, 1847. A woman in Dover, Arkansas, had written it to her husband while he was a soldier in the Mexican-American War. The letter had faded and turned brown, as might be expected of any well-preserved paper over 150 years old, except for one obvious exception: it was laminated in plastic. This fact raised the question: Is lamination a safe and effective way to protect old paper documents, such as letters, prints and maps, from deterioration? To answer the question, we spoke with Roy Perkinson, head of paper conservation in the Paper Conservation Laboratory at Boston's Museum of Fine Arts. Perkinson, who has been fighting the decay of paper for 35 years, explained that lamination was fashionable as a preservation method throughout the 1960s and 1970s. It was seen as a way of providing an impenetrable seal around paper, protecting it from marauders such as mold and bugs, the acids in air pollution, and the dirt and grease that often travel on human fingers. Those who tried lamination, though, quickly discovered its deficiencies. Many of the plastics that were used — and which are still sold on the consumer market — are not inert, meaning that they will react with the paper they're meant to preserve, thereby damaging it. Chris Lane, a ROADSHOW appraiser and co-owner of the Philadelphia Print Shop, argues that lamination breaks one of the cardinal rules of paper preservation. "Nothing should be done with old paper that is not easily reversible," Chris says. "That's the bottom line for any kind of conservation or restoration of old paper." Instead, Chris slides fragile maps and prints into plastic envelopes. "It's called encapsulation, and it's gotten more and more popular. The other thing that's nice is that it kind of clings to the paper and gives it added strength so you can handle it and bend it and turn it over. There's an even pull on the paper. It's really protected." The Library of Congress pioneered the use of plastic envelopes, which is a solution Perkinson likes. "Today the good news is that there are supply houses that actually sell Mylar envelopes for the protection of archival documents," he says. Mylar is the brand name of a plastic that is inert — unlike most of the harmful plastic sleeves typically sold at drugstores. But what of using lamination for an old letter that literally crumbles apart when it's handled? Once again, Perkinson is reluctant to laminate such old documents. For such degraded documents the long-accepted prescription, which dates back well into the 19th century, is called silking. It consists of pressing a fine layer of transparent silk over a document to give it strength. But it has gone out of fashion gradually over the past few decades because it too poses problems. "A colleague of mine at the Library of Congress showed me a volume of George Washington letters that had been silked many decades ago and they were working to get the silking off," Perkinson says. "The paper had stains from the silk or the metallic plates used." When he is asked to conserve seriously deteriorating paper, Perkinson will place strips of Japanese tissue paper behind the paper's cracks and tears to hold it together. And if a document is literally crumbling, he places an entire sheet of the Japanese tissue behind it. Perkinson often finds himself countering the common assumption that old documents and prints need extreme measures of any sort, much less plastic lamination, to preserve them. "There are fine documents made of fine rag fiber paper, made from cotton or linen fibers, that were commonly used back to the late Middle Ages, that hold up very well," he says. "Machine wood pulp paper made since the 1860s deteriorates much faster than the older paper." Apart from the innate desire to take care of them, the other reason to tread lightly on your family's historic documents is to preserve their value on the market should you decide to sell them. Lamination damages value. "Knowledgeable collectors would be astonished if an important 18th-century document ended up being turned into a place mat," Perkinson says. The conservator's parting advice to those who have old paper is to always seek out an expert. "It's a little bit like figuring out what medicine to take when you're not feeling well," says Perkinson. "You should go to someone who might be able to give some advice and guidance." Long, J. S., & Long, R. W. (2000). Caring for your family treasures. By Jane S. and Richard W. Long. New York: Harry N. Abrams. Archival supplies are not inexpensive, but it is important to make sure you have acid-free and archival conservation quality products. Bookkeeper deacidification aerosol or pump spray is very expensive, so common sense must be used in determining what paper products must be treated versus what would be nice to be treated, but may not be as critical as other products. 1 There are various archival supply sources. We have found Gaylord to be reasonable, fast in their delivery, and willing to work with churches in terms of their tax free status and in giving discounts. Gaylord Brothers, PO Box 4901, Syracuse, NY 13221-4901. Phone number for ordering and obtaining a catalogue: 1-800-448-6160. Their customer service numbers is 1-800-634-6307. 2 Conservation Resources International, 1-800-634-6932. Online at www.conservationresources.com/. They will work with churches in terms of their tax free status. · Once the high-priority people have been recorded, open it up to the entire congregation. Different people will remember different things (or will remember them differently), and people may come forward whom you were not aware of or had forgotten. · Develop a list of questions to serve as guidelines for the recording sessions so that there will be some consistency across interviewers and interviewees. · We ask questions about the individual’s own history as a UU and early memories of attending church or religious education, as well as memories of important events in the history of the church, such as constructing and moving to a new church building (see our sample questions). · If you are going to record someone who is hard-of-hearing or who processes information slowly, give him/her the questions to look over while you are getting the recorder ready. You can then guide the individual through the questions. · Ask each individual to sign permission or release form before being recorded. If a person who is interviewed does not want his/her voice to be used or wants to place some other restriction on the use of that recording, this information can be specified on the form. Our form is included in this packet as an example. · Why digital? We advise making digital audio recordings (rather than audio or video cassette tapes) because they are better for long-term preservation and storage. This is the current technology, and digital recordings can quite easily and quickly be duplicated and stored in several forms, e.g., on 2-3 computers, on multiple compact disks (CDs), portable hard drives, etc. In addition, digital recordings do not degrade over time as do audio and video cassette tapes. · If you have the capability, there are instances when digital video recordings may be preferable to audio recordings. However, such equipment is generally more expensive, and video files take up more computer storage space. In addition, a video camera is more intrusive and may be more intimidating to some interviewees than a small audio recording device. · As technology changes, someone (e.g., the church historian or some member of the history committee) will need to make sure that all of the recordings are transferred to whatever the new technology may be. · As appropriate, consider transferring some of the recorded information to the World Wide Web (e.g., a church web page, via a podcast, as archived documents, etc.) so that it can be accessed for research or informational display purposes. However, remember to seek signed approval from any interviewees (or a family member if the interviewee is deceased) to have their information shared in this manner. · For individuals who may not be used to manipulating cell phones, PDAs, or other digital devices, digital recorders can be intimidating. In addition, the buttons are small and have multiple functions. · For these reasons, it is important to spend time reading the instructions, becoming familiar with the recording device, and practicing/role playing with friends or family members. · After you are familiar with and have interviewed with a digital recorder we recommend training potential interviewers, facilitating their practicing with you or another person, and making sure they are comfortable interviewing others about church history and personal recollections. · Some people may find it most convenient to meet with you before or after church, while others will prefer to be interviewed at home. The main requirement is that the location is relatively quiet and comfortable and as free of outside distractions, traffic noise, background noise, and foot traffic as possible. · Sometimes two people (e.g., a couple) want to be interviewed together, particularly if one hears better or is more able than the other. This can work out very well, as long as the two people are not talking at the same time. · A major purpose of conducting these interviews is to preserve oral histories and personal memories of the church. Therefore, it is advisable to download each file as soon as possible after the recording session so that it does not get overlooked and to save each interview in multiple locations, for example, on 2-3 CDs, to be stored in different locations, and on at least one computer hard drive. · After ensuring that the information is stored in multiple locations, the file can then be deleted from the recorder, freeing up memory for another interview. · Please begin by saying who you are and where and when you were born. · Tell me about your family background. Where did your family come from? · Where did you attend church when you were a child, if at all? · What are your first memories of church life? Describe a typical Sunday at church when you were young. · Did you attend "Sunday school? If so, what was that like (e.g., activities/ projects)? · Were you brought up as a Unitarian or Universalist? · If not, what brought you to the UU church? · What brought you to this particular church? · How old were you when you started coming to this church? · Who was the minister at that time? · What do you most remember about him/her? · Tell me about the other ministers and also lay leaders that you remember. · What were some memorable events in the life of the church in your early years here: Religious Education, social events, things related to a minister, particular problems or challenges, social action activities, etc.? · Were you here when the current church was built? · Please tell me about that; what kinds of things stand out in your memory? · What leadership positions have you held in the church? · In what sorts of church-related activities and organizations have you been involved? · Why are you a Unitarian-Universalist? · What makes the UU religion different from others? · In your experience, what have been the significant events – good and bad – in the life and history of this church? · How do you feel the church has changed in the years you have been here? · What are your hopes for the future of this church? As a member, past member, or friend of May Memorial Unitarian Universalist Society, I hereby agree to be interviewed and audio recorded by the History Committee as part of their effort to preserve personal recollections of important events in the history of the church. Further, I give permission for all or part of the interview, either in spoken or written form, to be used by the History Committee for instructional or informational purposes, for example, on the church website, in written descriptions, or in historical displays. Explain the permission form to the person you are going to record, and make sure that it is signed by you and by him/her. If the individual wants additional restrictions placed on the use of the recording, s/he should specify that on the form. The history committee has developed a set of questions to help structure the interviews and to elicit certain types of information. These are just guidelines; refer to them as needed, but don’t feel that you have to get through all of the questions. If the person you are interviewing has a lot to say about a particular issue or event, let him/her talk about that. It works best to let the interviewee do most of the talking, with you asking questions as needed and following up on things that are said. Think of yourself as a human recorder. At the beginning of the session, give your name and the date, and ask the interviewee to also give his/her name as a recording id. When you return the recorder, leave a note with it telling who you recorded and the location of the files pertaining to your interview. Settings – The settings should be correct as they are; they don’t have to be changed. Stereo SP (2 hours) and Stereo High Quality or HQ (65 minutes) both give acceptable recordings. The Stereo SP is preferable because it allows a longer interview. The number of sessions that can be stored on the digital recorder varies with the recording settings used, the length of the sessions, etc. To be on the safe side, we want to download them often and erase the files. If the recorder beeps, that means that it is about to run out of memory and that it will stop. In that case the recording session may have to be cut short. The internal microphone should already be set on “conference” (rather than “dictation”) in order to also record the voice of the interviewer (p. 22). Make sure that the recorder is within a few feet of the person being interviewed and is pointed toward him/her. Both of you should “speak up.” The recorder should be placed on a soft surface, such as a padded chair. There is a small folded towel for this purpose in the bag. Don’t hold the recorder in your hand while recording, as that causes extraneous noise. Before the interview, make sure that the batteries are fully charged and that the settings are correct; push the HOLD button forward so that the settings will not accidentally get changed as you are transporting the recorder. Do not press the STOP button in the middle of a recording. If that is done, the recorder will automatically start a new folder when REC is again pressed. - Send the audio file as an email attachment to Rog Hiemstra. If you have your own digital recorder, use the suggested questions to structure your interviews, and send your audio files to Rog Hiemstra and M.L. Edwards with the name of the person interviewed, the date of the recording, and any other pertinent information (such as specific topics covered in depth in the interview). Please remember to have the permission form signed and to leave it at MMUUS for the History Committee. The purpose of the afternoon presentation was to talk about the media and public relations, portraying history to others in various ways, using the Internet to portray history, the importance of converting material to digital formats, and the value of networking. This was done through a PowerPoint slide show, an oral presentation, and dialogue among participants and resource people. The purpose of this final section is to provide a variety of material, information, and resources related to the various topics covered in the workshop. It is our hope that what is contained in this website will be of value as you carry out your own church history preservation and portrayal activities. All such material of enduring value, when no longer in current use by ministerial staff, church leaders, and church members, shall be transferred to the church archives. The MMUUS archival collection consists of paper, media, and artifacts related to the purpose statement. The bulk of these materials are in two locations. The first location is at the Syracuse University Archives where material is stored as per a July 7, 1995 agreement (see /suagreement.pdf). Selected papers, photographs, scrapbooks, and mementos pertaining to the initial years of the church and ministerial eras from Rev. John Storer through Rev. Glenn Canfield currently are there (see /suarchives.html). The second location is Room 8, lower level of our current building. The majority of this material is in seven filing cabinets, with supplemental material in other containers near these cabinets. Additional smaller amounts of material is located in the church office, minister’s office, DRE’s office, choir loft, Memorial Room, loft above the Social Hall, southwest storage room in the lower level hallway, RE supply room, and various members’ homes. Most of this additional material is undocumented and efforts are being made to move it to Room 8. Finally, a small but increasing amount of historical material is being digitized and stored on hard disks, memory sticks, CDs, DVDs, and the World Wide Web. Efforts are being made to continue this digitization effort for purposes of duplicating existing historical information, providing a long term storage and preservation alternative, and facilitating access. In addition, the History Committee needs to be cognizant of constantly changing technology and be prepared to migrate any digital material to newer formats as they become available. The MMUUS History Committee consists of a chair, vice chair, recorder, and various members. A treasurer may be selected if appropriate. The chair is selected by committee members and, if agreeing to serve, approved by the Board of Trustees during July or August of each year. Co-chairs, if appropriate, may be chosen. A chair (or co-chair) will serve no more than four years in a row and at least two years must lapse before a prior chair (or co-chair) can again assume the position. The purpose in periodically rotating the chair position is to infuse new ideas and constantly grow new leaders committed to maintaining the history collection and preservation activities. The vice chair, chosen from among committee members, substitutes for the chair as necessary and appropriate. The recorder, chosen from among committee members, provides minutes of committee meetings. Committee meetings are held at least four times each year. 1. Establish, monitor, and revise, as appropriate, collection policies and procedures. 2. Carry out ongoing collection, preservation, and storage activities. 3. Encourage participation in history committee activities among church members. 4. Continually portray church history through periodic displays, WWW information, newsletter articles, group presentation, and church service contributions. 1. Ensuring the physical and intellectual integrity of the historical collection. 2. Carry out paper and media preservation activities as appropriate and needed. 3. Facilitating and encouraging committee members and volunteers in carrying out the History Committee’s work, including seeking funds as needed. 4. Conducting periodic committee meetings and evaluation efforts as appropriate. 5. Representing the History Committee at Program Council meetings. 6. Facilitating the development of appropriate informational material for the church newsletter, web page, annual report, etc. 7. Work with the Minister and Director of Religious Education in promoting church history as appropriate. What Should Be Included In the Archives? 1. Primary papers, sermons, reports, documents, electronic media, and correspondence of historical relevance developed by the Minister, Director of Religious Education, Church President, and Board of Trustees Secretary. Include hard copies of electronic files and relevant emails as appropriate. 2. Annual budget information, financial statements, records of expenditures, relevant meeting minutes, and other material of historic relevance, including hard copies of electronic files and relevant emails as appropriate (church Treasurer’s responsibility). 3. Planning documents program reports, meeting agenda, meeting minutes, and correspondence of historical relevance developed by each church committee. Include hard copies of electronic files and relevant emails as appropriate. 4. Annual meeting reports, orders of service, newsletters (hard copies), and other office-related material of historical relevance, including hard copies of electronic files and relevant emails as appropriate (office administrator’s responsibility). 5. Other material not covered above: Membership records, dedications, marriage and memorial service records, records of church groups, photographs, newspaper clippings, media recordings, and planning materials pertaining to building revisions. It shall be the History Committee’s responsibility to arrange for these various materials. In addition, arrangements will be made with those responsible for the church web page to archive important web material. 6. Oral histories as gathered through interviews with church members and leaders. This information should be gathered by digital oral and/or video recordings. Note: A system for addressing storage, preservation, and access of current operating records needs to be developed and implemented. What Should Be Sent to Syracuse University? Selected material pertaining to each minister’s pastorate at MMUUS since Rev. Canfield should be stored at the Syracuse University Archives as it is preserved and prepared. See /suarchives.html for a model of the type of past material sent to the university. How Should the Collection Be Organized? Initially a simple accession process should be used to identify what we already have through a simple numbering system and a log sheet for each separate filing cabinet and known separate container (box, bag, folder, etc.). Maintain the ordering system currently in place. Numbers that correspond with the numbering system should be placed on each item. When this system is completed, digitize the information to facilitate identification, retrieval, and locating duplicate material. Create a process for removal of any item, identifying its new or temporary location, and for adding material to the current collection. When is identified and numbered, begin the process of reorganization, elimination of unneeded duplicates, and renumbering. Two or more members of the History Committee should participate in this reorganization effort. The ultimate goal is to create a finder’s aid to facilitate research and retrieval. Eventually such information will be added to a web page. An ongoing History Committee should be maintained. In addition, funding appropriate for preservation and maintenance should be available through the annual church budget, fund-raising efforts, and outside grants. It may be necessary to develop a sub-group within the History Committee whose responsibility is securing adequate funding. A system needs to be developed for acquiring new material at the end of each church year. This will mean working with the various individuals mentioned above regarding what should be included in the archives. 3. Each committee member will serve a minimum of two years, unless an early resignation is requested, and may serve an unlimited number of years after that time period. b. Determine the various locations where church archival materials are stored. 1. New York State Convention of Universalists (NYSCU) Grants - Two one-year NYSCU proposals for funding to assist with our preservation activities were approved, one in 2006 and one in 2007. These grants have enabled us to better preserve material stored at MMUUS and carry out other activities noted elsewhere. 2. Preservations Activities – We have many historical materials stored in Room 8 of the basement. We are carrying out related inventorying, organizational, paper preservation, media preservation, oral history, and digitization actions. 3. Web Page Efforts – A web page on Sam May (/sjmay.html) has been completed, as well as many other related web material already on the church web page or on an alternative web page (/ministers.html and /church-buildings.html. For example, an unpublished biography on Sam May is slowly being digitized and added to the web (we need volunteer typists). See /galpin-may.html. 4. 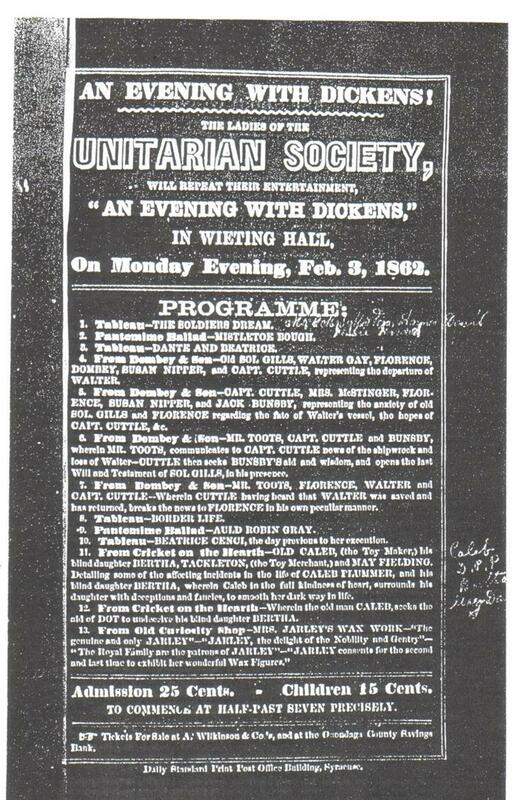 Improving Awareness – We have carried out a number of activities to enhance awareness of MMUUS’ interesting history, such as a regular newsletter column, periodic Social Hall displays, the repairing and mounting the Sam May marble tablet on our outside SW wall (/repairedtablet.pdf), the past ministers’ photos in the Memorial Room, etc. (/dedicationprogram.pdf), and occasional presentations within the St. Lawrence District regarding MMUUS’ history. · Continued preservation and web page development efforts - Volunteers are always welcome to assist with these efforts. · Permanent history display case - A lockable, enclosed display case will be mounted so periodic displays of historical material and memorabilia can be shown. · Preservation workshop - Members of the History Committee will conduct two one-day workshops on preservation, promotion, and display of historical material to interested church members and leaders (at MMUUS on October 27 and the Schenectady UU church on November 10). · Digitizing historical material - We are scanning, digitally photographing, converting audio tapes, slides, VHS tapes, etc. to digital material for long term storage and/or the Web. Contact Rog Hiemstra, Chair, History Committee: 315.637.3527 or rogerhiemstra@gmail.com for more information. Consider joining our History Committee and/or volunteering for any of these activities. We can always use more help. · Funeral and memorial service proceedings for Samuel Joseph May. · The rights and condition of women. 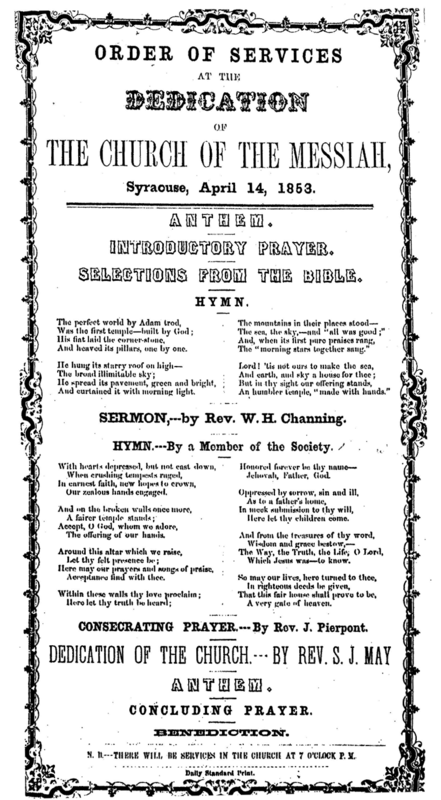 A sermon, preached in Syracuse, Nov., 1845, by Samuel J. May (also known famously as Tract #1).